I’ve told you about how gravity can be thought of as interactions with spin 2 particles, called gravitons. I’ve talked about how adding supersymmetry gives you a whole new type of particle, a gravitino, one different from all of the other particles we’ve seen in nature. Add supersymmetry to gravity, and you get a type of theory called supergravity. In this post I want to discuss a particularly interesting form of supergravity. It’s called N=8 supergravity, and it’s closely related to N=4 super Yang-Mills. In my articles about N=4 super Yang-Mills, I talked about supersymmetry. Supersymmetry is a relationship between particles of spin X and particles of spin X-½, but it gets more complicated when N (the number of “directions” of supersymmetry) is greater than one. I’d encourage you to read at least the two links in the above paragraph. The gist is that just like a symmetrical object can be turned in different directions and still remain the same, a supersymmetrical theory can be “turned” so that a particle with spin X becomes a particle of spin X-½ (a different type of particle), and the theory will remain the same. The higher the number N, the more different directions the theory can be “turned”. N=4 was something I could depict in a picture. We started with a particle of spin 1, then could “turn” it in four different directions, each resulting in a different particle of spin ½. By combining two different “turns” we ended up with six distinct particles of spin 0. Miraculously, I could fit this all into one image. N=8 is tougher. This time, we start with 1 particle of spin 2: the graviton, the particle that corresponds to the force of gravity. From there we can “turn” the theory in eight different directions, leading to 8 different gravitino particles with spin 3/2. After that, things get more complicated. You can “turn” the theory twice to reach spin 1. Spin 1 particles correspond to Yang-Mills forces, the fundamental forces of nature (besides gravity). Photons are the spin 1 particles that correspond to Electromagnetism. The spin 1 particles here, connected as they are to gravity by supersymmetry, are typically called graviphotons. There are 28 distinct graviphotons in N=8 supergravity. From the graviphotons, we can keep turning, getting to spin ½, where we find 56 new particles of the same “type” as electrons and quarks. On our fourth turn, we get to spin 0, the scalars, with 70 new particles. Turning further takes us back: from spin 0 to spin ½, spin ½ to spin 1, spin 1 to spin 3/2, and spin 3/2 to spin 2, back where we started after eight “turns”. I’ve tried to depict this in the same way as N=4 super Yang-Mills, but there’s just no way to fit everything in. The best I can do is to take a slice through the space, letting certain particles overlap to give at best a general impression of what’s going on. Graviton in black, gravitinos in grey, graviphotons in yellow, fermions in orange, scalars in red, incomprehensible in every color. That picture doesn’t give you any intuition about the numbers. It doesn’t show you why there are 28 graviphotons, or 70 scalars. 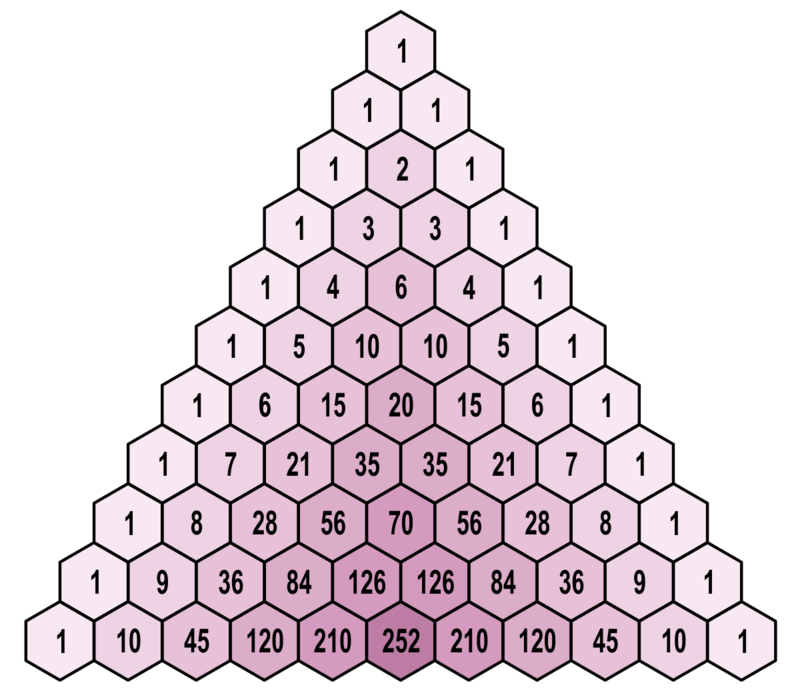 To explain that, it’s best to turn to another, hopefully more familiar picture, Pascal’s triangle. Getting math class flashbacks yet? Pascal’s triangle is a way of writing down how many distinct combinations you can make out of a list, and that’s really all that’s going on here. If you have four directions to “turn” and you pick one, you have four options, while picking two gives you six distinct choices. That’s just the 1-4-6-4-1 line on the triangle. If you go down to the eighth, you’ll spot the numbers from N=8 supergravity: 1 graviton, 8 gravitinos, 28 graviphotons, 56 fermions, and 70 scalars. That’s a lot of particles. With that many particles, you might wonder if you could somehow fit the real world in there. Actually, that isn’t such a naive thought. When N=8 supergravity was first discovered, people tried to fit the existing particles of nature inside it, hoping that it could explain them. Over the years though, it was realized that N=8 supergravity simply doesn’t provide enough tools to fully capture the particles of the standard model. Something more diverse, like string theory, would be needed. That means that N=8 supergravity, like many of the things theorists call theories, does not describe the real world. Instead, it’s interesting for a different reason. You’ve probably heard that gravity and quantum mechanics are incompatible. That’s not exactly true: you can write down a quantum theory of gravity about as easily as you can write down a quantum theory of anything else. The problem is that most such theories have divergences, infinite results that shouldn’t be infinite. Dealing with those results involves a process called renormalization, which papers over the infinities but reduces our ability to make predictions. For gravity theories, this process has to be performed an infinite number of times, resulting in an infinite loss of predictability. So while you can certainly write down a theory of quantum gravity, you can’t predict anything with it. String theory is different. It doesn’t have the same sorts of infinite results, doesn’t require renormalization. That, really, is it’s purpose, it’s biggest virtue: everything else is a side benefit. N=4 super Yang-Mills isn’t a theory of gravity at all, but it does have that same neat trait: you never get this sort of infinite result, so you never need to give up predictive power. Now, two predictions are at the fore. One suggests that this magic behavior will be broken at the terrifyingly complex level of seven loops. The other proposes that the magic will continue, and N=8 supergravity will never see a divergence. The only way for certain is to do the calculation, look at four gravitons at seven loops and see what happens. If N=8 supergravity really doesn’t diverge, then the biggest “point” of string theory isn’t unique anymore. If you don’t need all the bells and whistles of string theory to get an acceptable quantum theory of gravity, then maybe there’s a better way to think about the problem of quantum gravity in general. Even if N=8 supergravity doesn’t describe the real world, there may be other ways forward, other ways to handle the problem of divergences. If someone can manage that calculation (not as impossible as it sounds nowadays, but still very very hard) then we might see something really truly new.